Realcomm is the premiere conference focused on automated business solutions/state-of-the-art enterprise tech. IBcon is the most comprehensive and leading-edge event focused on the next gen of smart, connected intelligent buildings. 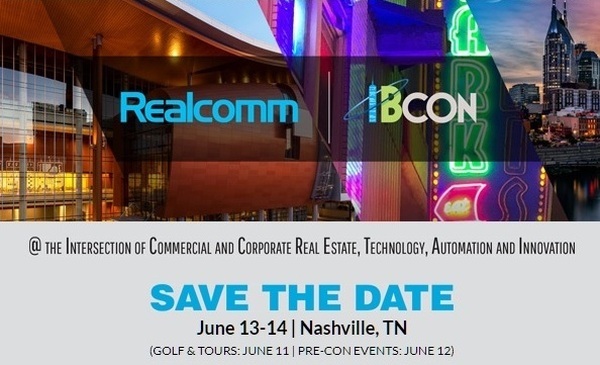 CARLSBAD, CA, January 16, 2019 /24-7PressRelease/ — Realcomm | IBcon 2019 is heading to Nashville! For four days in June, the music city capital of the world will become home to thousands of creative, forward-thinking and progressive Commercial and Corporate Real Estate and Facilities professionals from around the world. Realcomm is the premiere conference focused on automated business solutions and state-of-the-art enterprise technologies. IBcon has grown to become the world’s most comprehensive and leading-edge event focused on the next generation of smart, connected, high-performance, sustainable, intelligent buildings. This year’s Advisory Council will be chaired by thought leaders from industry powerhouses Highwoods Properties, Granite Properties, Brookfield Properties, Hudson Yards, ExxonMobil and Facebook. Visit our Realcomm | IBcon Advisory Council for a complete listing of advisors. Realcomm | IBcon 2019 will not be made possible without the continued support of our Platinum Elite Sponsor, Yardi, and Platinum Sponsors, Altus Group, MRI Software and One11. Visit Realcomm | IBcon Sponsors for a complete listing. For more information and/or to register early and save, visit www.realcomm.com. Realcomm Conference Group LLC is a worldwide research and event company at the intersection of technology, innovation and real estate operations. Through our annual conferences, webinars, workshops, CIO Forums and other strategic services, Realcomm provides networking and collaboration opportunities, while educating industry professionals about the latest business solutions and technologies to improve commercial real estate development, leasing, management and operations.